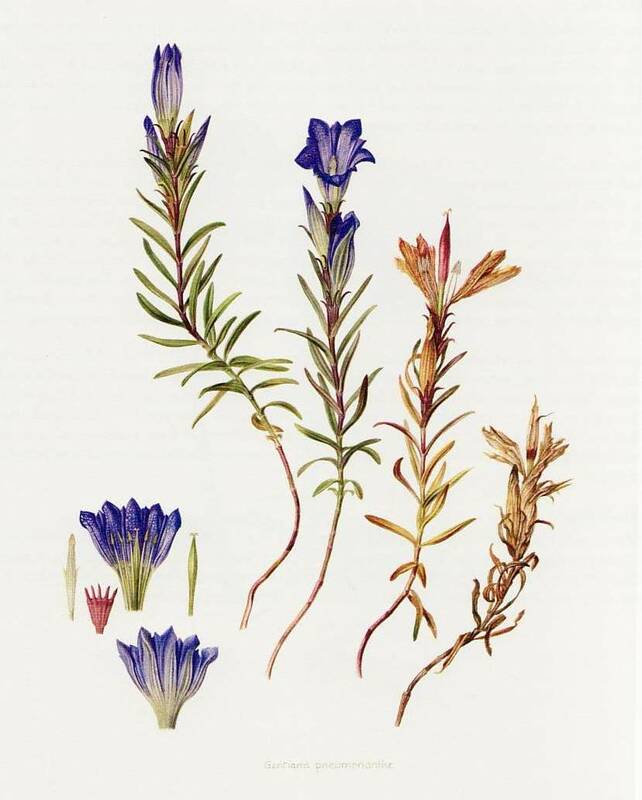 Marsh gentian is being studied all over northern Europe, mainly because of its fascinating relationship with the rare Alcon blue butterfly. Adult Alcon blues lay their eggs on the outside of marsh gentian flowers, and when the larvae hatch, they emerge inside, where they begin to feed on the flower. After molting 3 times, these caterpillars chew through to the outside of the flower, then lower themselves to the ground on a “silken thread”. The caterpillar awaits the arrival of a Myrmica ant, which adopts it and carries it back to the ant’s nest. There it is fed by the ant colony through the fall and winter, growing quite large. In spring it forms a chrysalis, then emerges and exits the colony as quickly as it can to avoid being killed by the ants. Encroaching tree cover is one of the reasons for the marsh gentian’s shrinking range. Their largest threat however, is the modernization of agricultural practices. 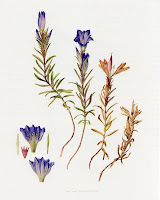 Since we both live nearby, I became close friends with a botanical artist and a volunteer warden of Tadnoll Heath, which is close to Winfrith Heath. This area, though small is very richly varied and contains a multitude of plants. In late summer the brilliant blue flowers look spectacular with the orange yellow of bog asphodel and the crimson haired sundews that thrive in the same damp conditions, all together making a glorious mosaic of colors. I spent many happy hours walking on the heath, hunting for plants.